This lovely four bedroom, 2 1/2 bath home is located on a quiet, paved, dead end street in Katama. 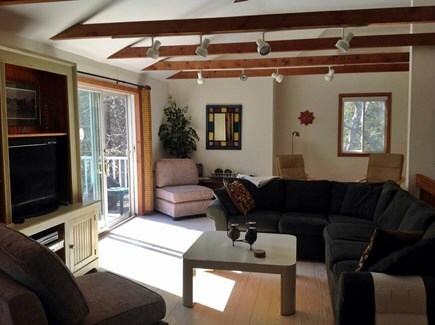 The upstairs living area is open and sunny, allowing space for couples or families to enjoy time together. A large mini split air conditioning system provides quiet cooling for any hot summer days. 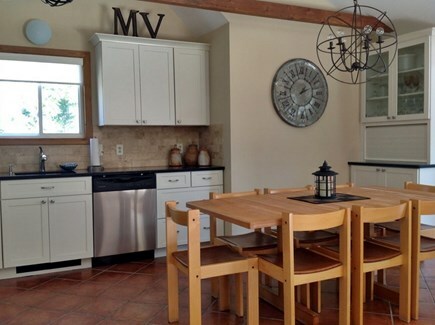 A modern kitchen with all amenities and granite countertops with seating for eight makes this a perfect family vacation spot. 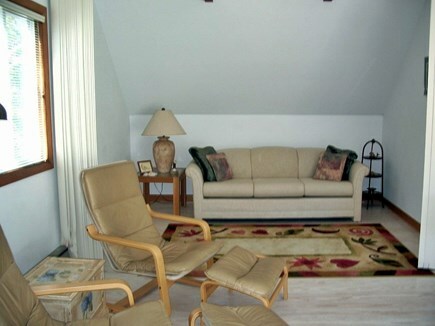 The large living area with an entertainment center and an alcove for reading or relaxing provides space for everyone. Cable and internet are provided. 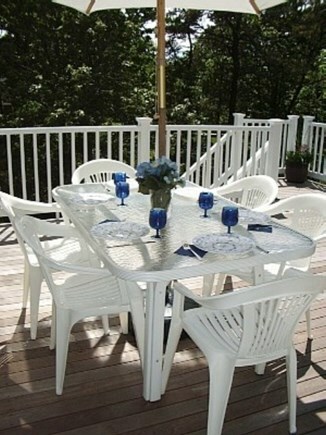 There is a large, south-facing deck with a table and chairs for dining, as well as lounges for sunning. 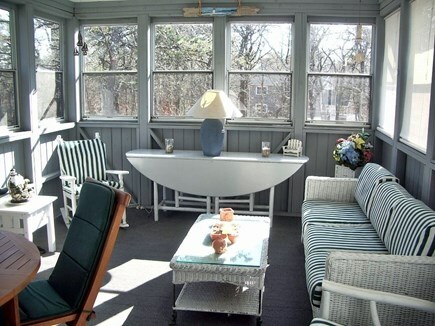 Attached to the living area and deck is a screened porch with comfortable seating as well as a table for 4 for dining. There is also a half bath adjacent to the living area. 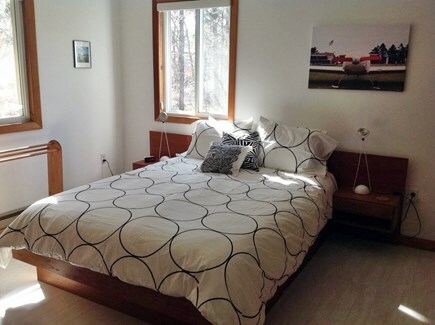 The 4 bedrooms and two full baths accommodate up to 9 people. 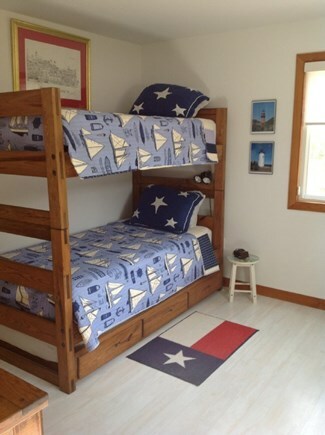 There are 3 queen beds as well as three singles in a bunk room. 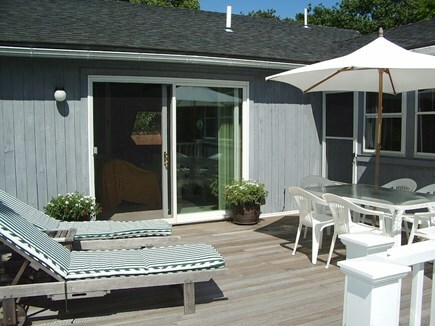 Below the large deck is some additional seating, a gas grill and an outdoor shower to rinse off after the beach. A bike rack is also provided. 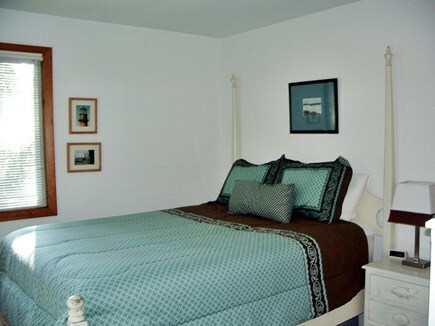 The dead end street is perfect for young children and is in a quiet residential neighborhood. 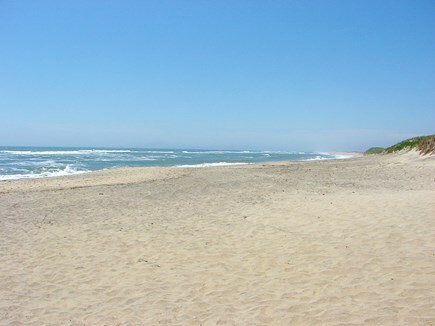 We are located close to the bike path and halfway between lovely Edgartown and South Beach. Additional pricing info: $150 cleaning fee, State and local taxes of 9.7% will apply. This house was just as pictured! Very well stocked and close to South Beach on a quiet street. 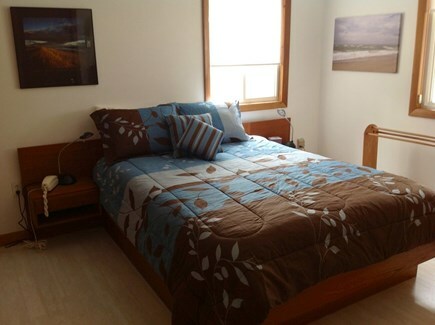 Slept 7 adults comfortably ( one in twin bed) and was very clean. Had a great time and had the security deposit returned promptly after renting with a nice note. We would stay here again! This house was amazing. It was exactly as the listing described. 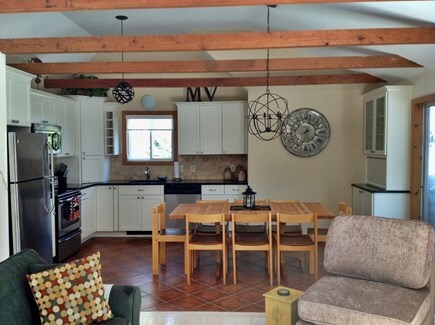 It was clean and the kitchen was well stocked with dishes, coffee maker, etc. 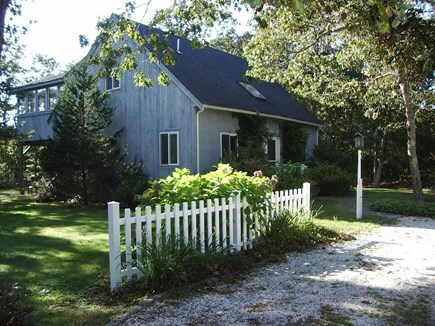 The house was within biking distance to the village and the beach. The owner was very responsive and returned the security deposit within a week. I would definitely recommend this house to anyone who is looking in the area.